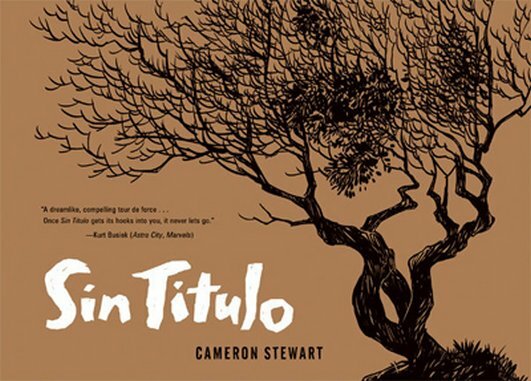 Originally published as a serialized web series, which won a 2010 Eisner for Best Digital Comic, Cameron Stewart’s noir narrative Sin Titulo is now available in a nice hardcover format, where it may work better. As you read a series week by week, you have the opportunity to examine every panel carefully, digging for clues. But reading the same pages in a single sitting is a different experience, one that minimizes flaws through speed and promises some sort of resolution other than a fizzle, or the growing realization that the author may not know where he’s going. That is not to say that the collected Sin Titulo is an entirely satisfying creation, bundled up neatly in the end. It’s more akin to the works of Edgar Allan Poe, David Lynch, Charles Burns, and Daniel Clowes: the atmosphere and the moments of fear it provokes are stronger than the mechanics of the plot. Like all classic noir, Sin Titulo begins with an ordinary situation and an ordinary protagonist. He moves into a new environment. He sees something a little weird out of the corner of his eye. And blammo! He’s down the rabbit hole, getting conked on the head repeatedly and encountering dangerous dames, never certain what’s real and what’s not. Stewart’s not a tremendously innovative visual storyteller — his characters could be more expressive — but he has his moments. He manages, for one thing, to capture the feeling of being unsure whether you’re awake or asleep without resorting to blurriness. Each page consists of the same identically-shaped eight panels, four over four, and it can get repetitive, but it also lends a solid structure to the action, a weight that counters the surrealism of the happenings. Is it a flaw that Stewart tries to solve the mysteries he creates? Only because he doesn’t quite do them justice. It’s nice that he isn’t satisfied with mere obfuscation, and he attempts some kind of statement about the nature of art in the process of wrapping up, but resolving a clockwork universe is a delicate and difficult act. Sin Titulo doesn’t entirely succeed, but that doesn’t mean it’s not worth reading.